The Samsung Galaxy S10 Plus is said to be available in 128 GB, 512 GB, and 1 TB storage variants, and one of the color options for the 1 TB variant is Ceramic Black. 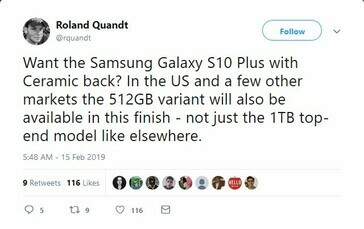 Roland Quandt has tweeted that even the S10 Plus 512 GB version will be available in Ceramic Black in the US and elsewhere. We are also getting to know that the price of the Galaxy S10 Plus, though still expensive, will be cheaper than its nearest competitor, the Apple iPhone XS Max. We're just a day away from the Samsung Unpacked Event in San Francisco but the leaks still keep coming in. While we know a fair bit of what to expect from the three anticipated Galaxy S10 offerings, the latest information is that the Ceramic Black finish of the Galaxy S10 Plus 1 TB will also be coming to the 512 GB variant wherever it is available around the world. The Samsung Galaxy S10 Plus ("Beyond 2") will feature an Exynos 9820 or a Qualcomm Snapdragon 855 SoC and will come in 6 GB/128 GB, 8 GB/512 GB, and 12 GB/1 TB RAM and storage variants. So far, we knew that the 12 GB /1 TB model will be available in Ceramic Black and Ceramic White while the 8 GB / 512 GB is expected to be available in Prism Black, Green, Pearl White, and Blue finishes. Now, it looks like the 512 GB version will also have a Ceramic Black option according to famed tipster Roland Quandt. 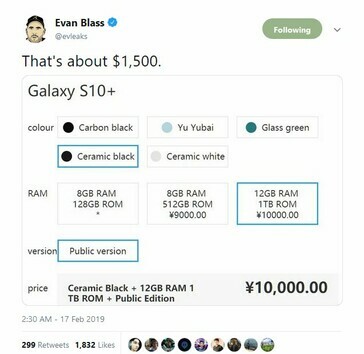 Apart from the new Ceramic Black color option in the 512 GB variant, we seem to have more or less confirmed prices of the Galaxy S10 Plus thanks to Evan Blass. According to Blass, the 8 GB / 512 GB version will retail for ¥9,000 (~US$1,300) while the 12 GB / 1 TB version will set you back by ¥10,000 (~US$1,450). Blass's screenshot also seems to suggest a pale green 'Yu Yubai' color variant that is likely to be exclusive to the Chinese market. The prices are somewhat cheaper than the S10 Plus's nearest competitor, the Apple iPhone XS Max. The iPhone XS Max does not have a 1 TB variant but the 512 GB version costs US$1,449. Samsung might have an edge in price here and could potentially further dent the already sluggish sales of the new iPhone models. 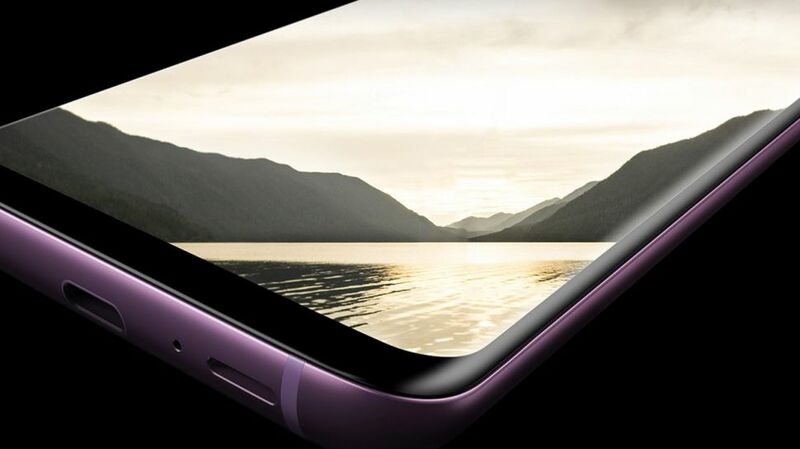 Previous leaks, however, have suggested a US$1,410 price for the S10 Plus 512 GB. The latest pricing information could be true considering that the foldable Galaxy X is tipped to cost nearly US$2,000. Samsung would want to keep the price of its mainstream Galaxy variants relatively cheaper in order to boost sales. In any case, we will be knowing a lot more information on February 20 so stay tuned.